When Indigenous people share their stories with journalists, it is a part of the reconciliation process and not about assigning blame, the executive director of APTN said during a recent panel discussion about news coverage of Indigenous communities. Karyn Pugliese, a member of the Algonquin First Nation of Pikwàkanagàn, said Indigenous people have stories to tell that come from places of hurt and anger and aren’t always easy to hear. “When we tell you these things, we’re not blaming you,” Pugliese told the crowd of about 200 people attending the panel discussion at Ryerson’s School of Journalism. “We know you didn’t do it. We know you weren’t the ones that murdered our sisters and you aren’t the ones who ripped the babies out of our arms and put them in residential schools. You weren’t the ones who [took] our leaders and put them in jail. We know these things. And I think I’ve noticed that we’re starting to get to the point where Canadians are saying, ‘okay, yeah, I didn’t do that, and I know you’re not blaming me, so I can listen to you,’” she said. 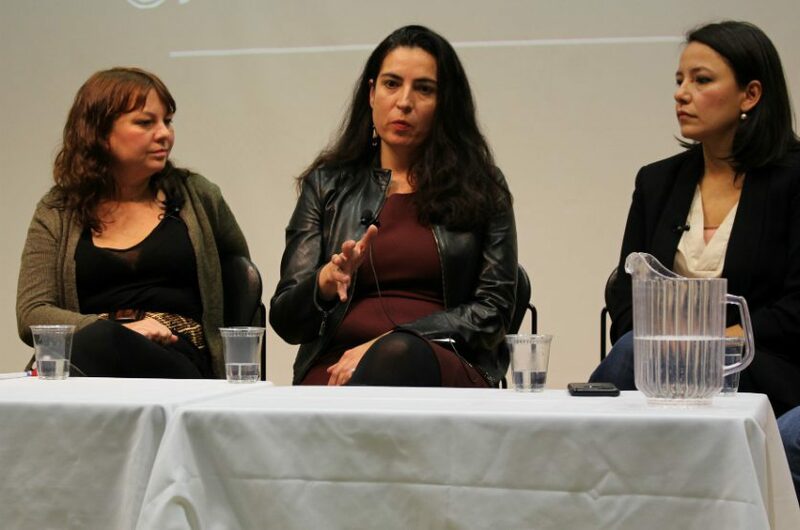 Pugliese joined three other Indigenous journalists on Nov. 3 for “Beyond Missing and Murdered Women: Covering Indigenous Communities,” a presentation organized by the Canadian Journalism Foundation. The panel was moderated by CBC journalist and Cross Country Checkup host Duncan McCue. Building rapport with people and communities is a necessary part of the process of reporting on Indigenous issues, said Lenny Carpenter, program manager for Journalists for Human Rights’ (JHR) Indigenous Reporters Program. Tanya Talaga, one of the reporters for the Toronto Star’s award-winning series on missing and murdered Indigenous women, said that being respectful and making time to listen is part of this relationship-building process. Connie Walker, an investigative reporter for CBC National News who has reported extensively on Indigenous issues, said newsroom attitudes are changing and it’s getting easier to sell editors on Indigenous-related news stories. Ten years ago, story ideas involving Indigenous communities would often be dismissed by editors who thought the ideas weren’t new or would not be of interest to audiences, said Walker. Pugliese agreed, observing that stories about Indigenous people have become mainstream and that the way they are covered has changed. “In the ‘70s, if an Aboriginal women went missing or was murdered, the headline might read: ‘Dead Indian found by river.’ This is significantly different than the way you might cover it if a young non-native girl had gone missing. And there’s a name for it that came out of the States – it’s called ‘missing white women syndrome,’” she said. Pugliese said that positive coverage of such a case might include naming the missing person in the headline. An example, she said, would be “Alicia, please come home,” because it names the victim and humanizes her story. “I’ve noticed a big change from eight years ago, where we actually are seeing our women treated equally when these things happen, or more fairly when these things happen in the media,” Pugliese said. Buried Voices, a JHR report that examined media coverage of Indigenous issues in Ontario from 2010-2013, concluded that there would have to be seven times more stories in the media for news coverage to reflect the size of the province’s Indigenous population. While a more recent JHR study, Buried Voices: Changing Tones, reported little improvement in the representation of Indigenous people in Ontario media, it did find a major shift in tone. Over the past three years, stories involving Indigenous people have been, on average, 30 per cent positive in tone (up from 23 per cent in 2013) compared to 11 per cent negative (down from 33 per cent). “As much as we’re seeing a shift in terms of the kind of stories we’re hearing from Indigenous communities, I think we’re [also] seeing a shift in the inclusion of Indigenous voices in regular mainstream stories that aren’t Indigenous focused,” Walker said. An example of this, she said, is McCue’s role as host of CBC’s Cross Country Checkup, a weekly open-line radio show that discusses issues of national interest. As an Indigenous journalist, she noted, McCue brings a perspective to the issues discussed on the show that is the next level of inclusion of Indigenous voices.